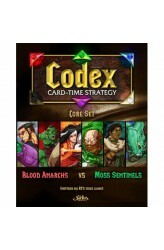 Codex: Card-Time Strategy is a customizable, non-collectable card game set in the Fantasy Strike universe that's inspired by real-time strategy video games such as Starcraft and Warcraft 3. Players each control three different heroes and have access to a tech tree that allows them to use different strategies each time they play. The goal of the game is to destroy the opponent's base. To do this, players build up an army of units and heroes. Players determine the exact composition of their armies as they play by adding cards to their deck based on the tech they've chosen to pursue. https://www.youtube.com/watch?v=43_ZGOsqvfk .. 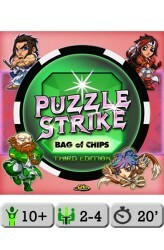 Puzzle Strike is a card game played with cardboard chips instead of cards that simulates a puzzle video game such as Puzzle Fighter or Tetris. It's a deckbuilding game, which means you build your deck *as* you play the game. Every game is different because the bank starts with a different set of chips each time. Also, there are 10 characters to choose from in the base set, each with different gameplay. Between all that, there are over 411 MILLION starting conditions in a 4-player game, and even more if you include the expansion. A built-in comeback mechanic means that when you're on the edge of losing, you're also able to do even more combos than usual. You don't have to worry about shuffling cards because you just put your cardboard tokens in a bag and shake them up to shuf..